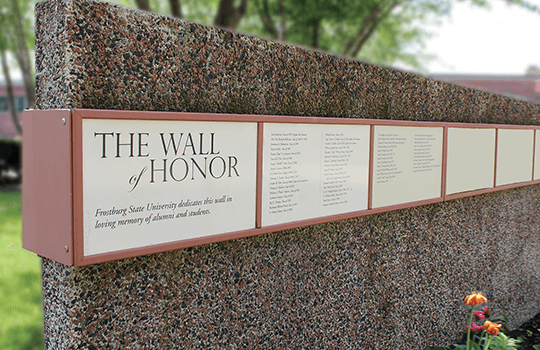 For many years FSU has been helping individuals honor the memory of loved ones at the campus Memorial Wall in front of the Performing Arts Center. There, alumni, students, faculty, staff and friends of the University whose memories are etched in our hearts forever can be remembered every day in a lovely place of serenity and peace in the heart of the Frostburg campus. Now, in response to many requests, the third wall in the grouping will be designated specifically to pay tribute to living individuals because of their dedicated service to FSU or the surrounding community or for similar reasons. The cluster of three walls will now be called the Frostburg State University Wall of Honor, with the original two walls still dedicated to memorials and the third to honoring those who are still with us. To honor a loved one, close friend or long-time mentor, a contribution of $500 is required for each name. Your donation is restricted to the Wall of Honor Fund, used for campus beautification. To add a name, please contact Shannon Gribble '98, Director of Alumni and Donor Relations at 301.687.4068 or complete a Wall of Honor Registration Form (PDF).